Hackettstown, N.J. (January 28, 2019) – M&M’S® announced today that the newest addition to the chocolate aisle – M&M’S Chocolate Bars – will be featured on the iconic No. 18 M&M’S Toyota for the 2019 Monster Energy NASCAR Cup Series opening race in Daytona Beach, FL. 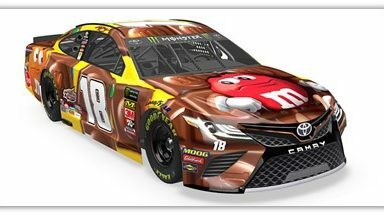 The new treat from M&M’S, which hit shelves late last year, will grace the No.18 M&M’S Chocolate Bar Toyota driven by 2015 Monster Energy NASCAR Cup Series Champion, Kyle Busch, at four races during the 2019 season. The new M&M’S Chocolate Bar paint scheme will delight M&M’S fans who are accustomed to the chocolate giant using its partnership with Joe Gibbs Racing, and role as the Official Chocolate of NASCAR, to highlight the brand’s latest product offerings and innovations. M&M’S Chocolate Bars are available now in retail stores nationwide in five delicious flavor varieties including Peanut, Milk Chocolate, Crispy, Almond and Crispy Mint. The new bars consist of smooth milk chocolate with whole M&M’S Minis throughout. M&M’S Chocolate Bars mark one of the most notable product innovations in the brand’s history. The new permanent additions to the brand’s iconic candy lineup are the result of several years of development. A team of M&M’S Chocolate product developers tested nine flavors and four different formats before landing on the perfect recipe and shape to ensure each piece includes the ideal ratio of smooth chocolate and crunchy M&M’S Minis. For more information, fans can visit the M&M’S® Brand on Facebook, Twitter and Instagram, or at www.mms.com. Race fans can follow all of the chocolate fun on M&M’S Racing Facebook page.